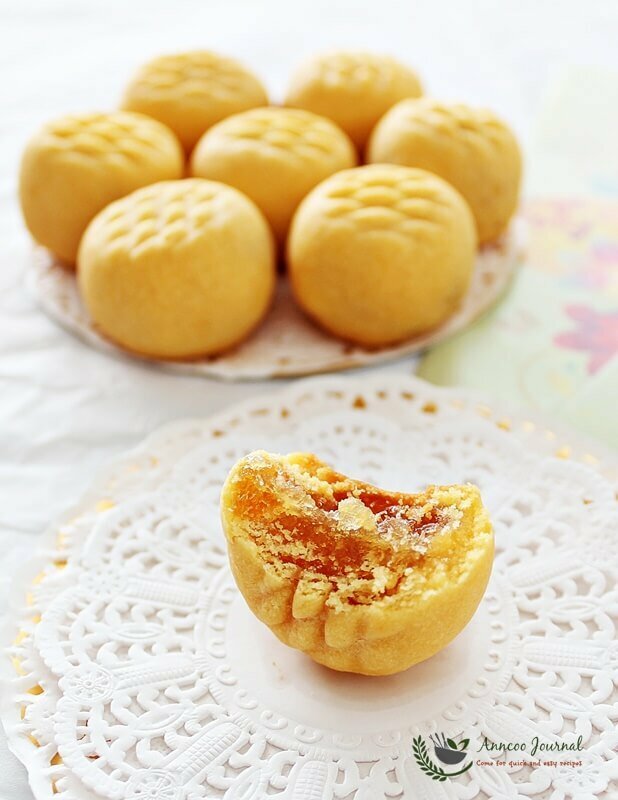 Pineapple Tarts are considered a festive cookie, popular in Singapore, Malaysia and Taiwan ~consumed during the Chinese New Year. These are small bite size pastries filled with pineapple jam which made in typical shapes include a flat open tart topped with pineapple jam or rolls filled with pineapple jam. In a mixing bowl put cold butter (cut cubes), honey, vanilla essence, egg yellow colouring, egg and icing sugar together and mix roughly till mixtures crumbly (30 seconds). Then add in the plain flour and custard powder and mix the mixtures for another 30 seconds. Place mixtures on to dusted flour table and knead to a smooth dough (put on plastic gloves). Divide dough into small portions (about 12g each) and wrap with pineapple jam. Use a roller pin to create design. Bake at 180C for about 15 mins. Hi Ann, I come here through baking language site. Is it tricky dough to make balls without aircon? Hi Tom, you don’t need an aircon to make the pineapple tarts. The dough will not melts. Hi Ann, may I know where to buy the roller pin? Can I get from Phoon Huat? Thanks! Hi Ai Li, Yes, I got the roller pin from PH. Those look so yummy, Ann! Happy CNY! hihii…Zurin, I think your tarts look so much better than mine. I didn't use egg wash, just add little egg yellow coloring. ahh ur tarts are so lovely Ann!!! love the shape..i'm just one big fat lazy…too lazy to wrap the jam up like u do! i mite try tho :)) yes the custard powder makes it light , dont u think? n golden too! Thank you Rita 😀 Next year I'll send you some of my pineapple tarts. (sorry not this time because I had distributed all to my friends & relatives). Rachel: Thank you for your compliment! WOw, these look lovely! And I'm a pineapple fanatic. thanks for sharing! 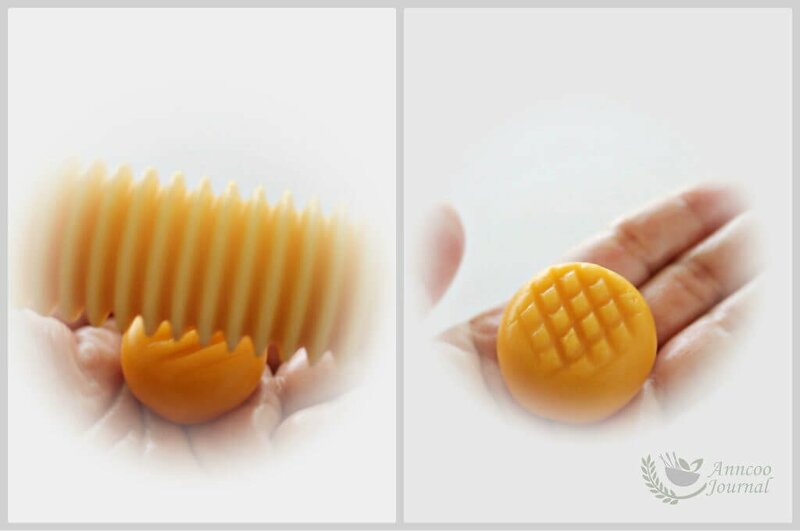 Your pineapple tarts have to be my best…..so much fiulling inside…..yum. I want the pineapple cookies and also the ang pow there 😛 Got $$$$ inside, right? 😀 Wishing you a very Happy & Prosperous Chinese New Year! Sonia: Happy New Year to you & your family. Wendy: Same to you too! Have you cooked any special food for CNY? Biren: Thank you 🙂 Happy and a Prosperous Lunar New Year to you! Brenda: I wish you a Very Happy Lunar New Year and all the best! Petite Nyonya: Next time let me know earlier so that I can send you some of my home made cookies. 新年快乐! Cooking Gallery: Hahaa…are you sure? Happy New Year & Happy Valentine's Day! Blessed Homemaker: Thanks! Happy Lunar New year! Cookie: Thank you 🙂 Same to you too! Thank you for your nice words ;D Happy Valentine's Day!! The pictures are gorgeous and these pineapple treats look delicious. Happy new year to you! Your recipes were a HUGE success!! Thank you. Have a wonderful roaring year ahead! The tarts are perfect for the celebrations 🙂 Happy Chinese new year to you too , Ann !! Happy Chinese New Year:)! I still have a box of pineapple tarts from last year, I will have a look if I still can eat them ;-). your pineapple tart look so cute and full of filling!! Gong Hei Fatt Choy to you and family!! Hi Anccoo, wishing you & your family Gong Xi Fa Cai and a joyous celebration! I had no time to bake any cookies at all this yr. I miss pineapple tarts after looking at yours. Now last minute, am baking a cake only :). Anyway its a quiet affair for my family this year so not much baking at all. Have a prosperous new year and have fun! Cheers! Wishing you & your family a very happy and prosperous chinese new year! 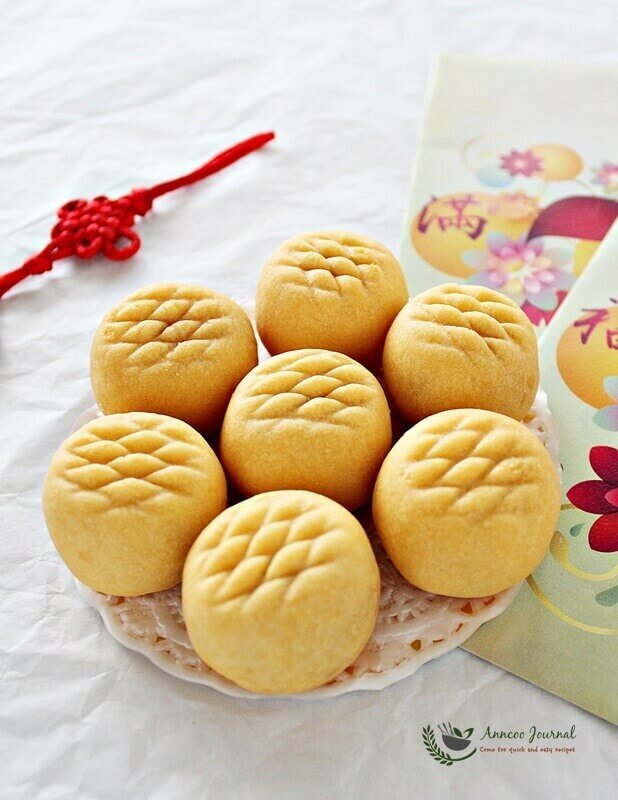 Pineapple tarts look yummy! Oh baby, those look good! I bet they'll go great with my cashew chicken! MMmmmm! God bless and ya'll have a wonderful Valentine's Day!!! I love pineapple tarts! Have not eaten them for a while now…very time consuming to make. Wishing you a Happy Chinese New Year and Valentine's Day! Happy new year, anncoo! This post reminded me that I should call my parents in Korea and wish them a happy new year, too. Thanks! 🙂 Oh and the cookies look incredible. by the way….happy valentine's day too! Hey Anncoo…wish you and family Happy Chinese New Year and All FA CAI!!! Anncco, Wishing you and your family a Happy CNY and Happy New Year. Hi Friends, Thanks for all your lovely comments:) Happy Lunar New Year to all!! Tatabonita: Thanks! Happy Lunar New Year to you! happy chinese new year anncoo! I have never tried these tarts before! sounds sweetalicious! Oh, no more cookies from you?…oh, I am feeling so sad…. Your cookies look amazingly delicious. Happy New Year to you and your family!!! Happy new Year Ann n to ur family too! lovelt lovelytarts!!! Happy Chinese New Year to you!!! 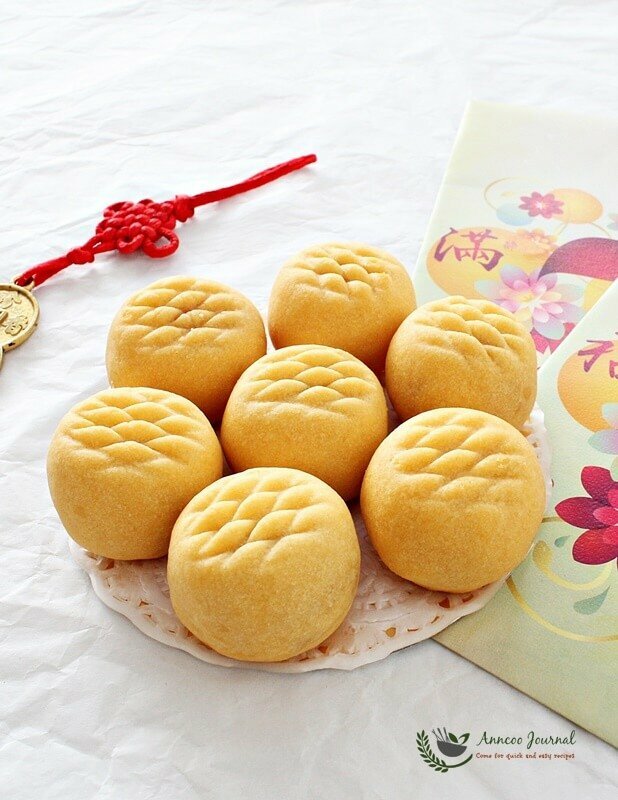 The pineapple tarts look very good, Very festive. I just love your pictures! I wish you a happy new year! Love all of your pictures taken. Happy Chinese New Year to you & your family. Wishing you and family a prosperous new year.